We have lived in this neighborhood since May 2010. It borders a tidal creek and there is a golf course. It's such a treat to walk the cart path on holes 17 & 18 as the marsh borders these holes. Every day brings something wonderful to see and experience. Please walk with us. I want to show you my favorite sights. I want to show you the things that fill me with wonder - it's like being a child all over again for me. Nature. There is nothing like it! This is wonderful. I wish I could do this. Meaning, I wish I WOULD do this. Something I need to work on this year. 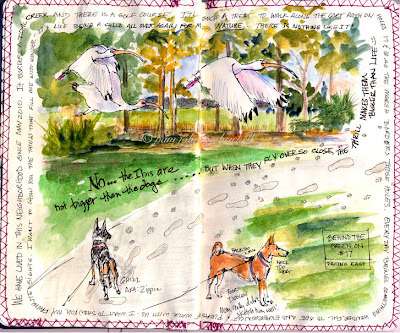 Look forward seeing more of your area via journaling. Hi Chris! Thank you! Of all the journaling I've done over the years, this is my first themed and finished journal... Well not really finished as there were limited pages and certainly limited time! It was difficult to send the book back! I can only urge you and everyone, no matter your individual skill level, to push forward and create a journal about something that's close to your heart. Everyday pleasures are such treasures!! I have such a smile in my soul from this experience :) True soul food! His watercolors have freshness, vitality. Everything here is lovely and amazing! You're right: "Nature. There is nothing like it!" I can imagine it was hard to put this one in the mail - a real piece of your home and daily walks with your buddies :) I so admire your journaling/sketching skills. Thanks Li, for stopping by and for your appreciation! Thank you, Rhonda! I'm still digging out from this consuming adventure. I have a lot of catching up to do with your paintings/postings!